We have finished all the flight testing needed prior to installing the J-85 jet engine. 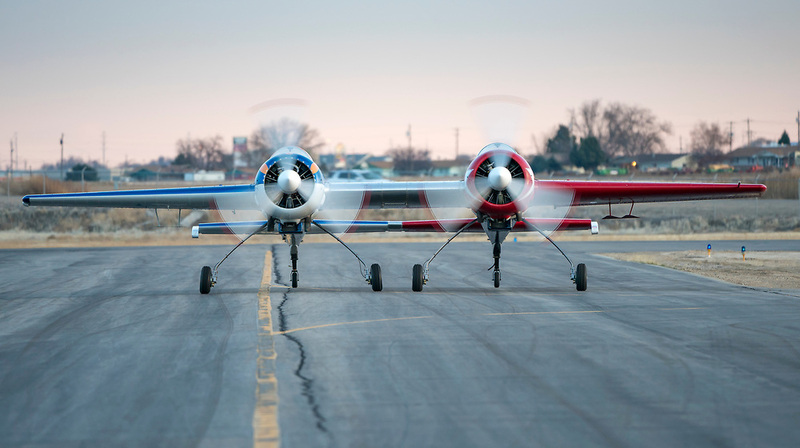 The airplane is flying great and has all the aerobatic characteristics of the single Yak 55M. The outboard horizontal stabilizers and elevators have been cut down to about half their original size and all the weight and balance calculations have been completed. Ben Anderson and I will be joining Dell in the shop for jet engine installation and center section completion in an effort to fly with the jet engine within the next week. We are very close and getting excited to see what this one of a kind amazing machine is capable of. I will keep the group updated as we count down to the first flight of the jet powered Yak 110! Thank you all for your support in this huge group effort to bring something innovative and new to the airshow world. 1 Reply to "Flight Testing Completed prior to Jet Engine Install"
Awesome, a jet engine! We look forward to seeing, and hearing, your jet powered Yak 110.